Well, hello everyone, I'm RonSS, and I'm a new EM owner. I picked up a wonderful little Pin Up and nearly everything works right from the start! She was pretty dirty, so I did a nice clean up, and of course, in the process, something got messed up. My 10 drop targets will still drop, and score, but there is no longer a bell/chime that goes along with them, except the far left once in a while. I'm pretty certain they were all ringing before. The other roll overs all work fine with score and bells. While I was replacing some plastic, one of those star acorn nut things dropped into the cab. When I retrieved it, my gorilla hands definitely banged up against some of the internals. Would this be the first place to look? If so, I have zero idea what it is I am looking for. I'd also like to take this time to personally thank Gottlieb for insisting that their schematics not be distributed freely on the internet, but rather only sold. If someone wouldn't mind pointing in a possible direction I'd certainly be grateful. I started to look up the usual sites, but most of that seems driven toward scoring reels and such, and I'm trying to NOT start playing with everything before I have 8 things wrong instead of 1 or 2. Thanks for any help you can offer, I'm enjoying tinkering with this thing already. While I was replacing some plastic, one of those star acorn nut things dropped into the cab. When I retrieved it, my gorilla hands definitely banged up against some of the internals. That would be a good start. Compare, and look for things that look bent, out of place, etc. Very good idea to only work on the known problem and not create new ones. Oh, and hi, and welcome to Pinside! Just ran a test. When I drop the left most target I here clicking (like 5) followed by a chime. All other 9 top targets will advance score but I hear no clicking or chime. Does that mean something to anyone? Contacts look good. Sparking when connected. I manually activated switches, only one engaged the motor. Does this sound like a setting or a wire issue? Or neither? Did some more poking around. The hundreds wheel resets by 500 each time the start button is pressed. So I'm seeing either 3 or 8 to start. Somehow, when I score 500 points it gives me 510. How do I even get 10 points? The ones roller is very warm to the touch. Also, how do I get 1 point? The upper band area just below the 10 drops has a switch, but nothing happens when touched on either side. Lastly, in the new department, I've got a loud hum/buzz going on. Other than those things and the chimes not working on the drops it's great! I'm certain I can remedy this stuff,aybe I'll watch a little "have pin will travel" on youtube tonight. Time to buy a schematic I guess. Oh, also, what does this switch do, left/below the wheel with yellow wires? When I touch the leaves I see and hear nothing. PM me with your address, and I'll swing by and straighten that game out for you. Just supply plenty of cold beer and snacks/sandwiches! Sounds like you definitely have a stuck switch somewhere. I fully expect you to let me get my hands dirty though. Learning is fundamental. I will, of course try to instruct you as we go along. 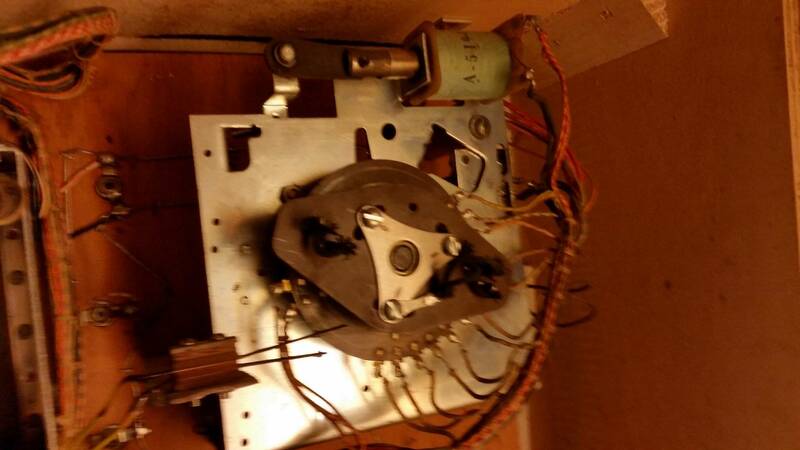 EM machines aren't really hard to repair , especially single player Gottliebs. 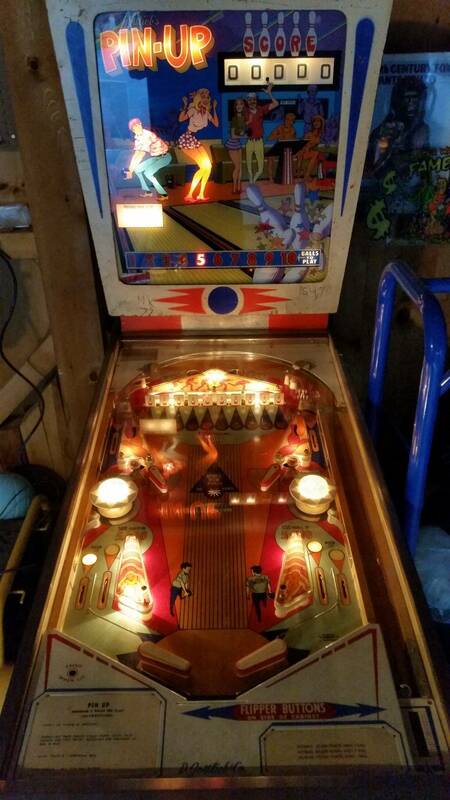 Wanted to publicly thank JRPinball for coming over today and getting my Pin Up up and running. Really nice guy and a great tech too! I had fun meeting you and "fiberdude". That one remaining issue with the "Pin-Up" is bugging me though. Why just the first drop target? That Foster's Ale was great. Gotta try to find me some.